Pond Boss Magazine turns 25! Anyone with an inkling of passion for lake and pond management would thoroughly enjoy reading “Pond Boss” magazine. It is folksy and fun to read while being incredibly informational. I read every issue cover to cover, not so much because I don’t already know the material, but because the stories are so interesting. The publisher, Bob Lusk, is an experienced lake management consultant who cares about people and natural resources. I know he is as surprised as anyone that the magazine turns 25 years old this month. Bob and I have often discussed how similar our careers have been. We both graduated from college in the mid-1970s and were lucky enough to get fishery jobs. We both started our own businesses about the same time (early 1980’s). Both companies were more interested in producing fish for sale than for creating productive fishing lakes and ponds. At that time aquaculture was a place to make a living while lake management was for university Cooperative Extension publications. State run hatcheries were transitioning from providing “free” fingerling fish for stocking farm ponds to only stocking public lakes. An opportunity developed for selling fish for private lake stocking and both of us jumped at the opportunity. I had been working for North Carolina State University doing aquaculture advisory service. The university encouraged me to write a newsletter that was mailed to anyone interested. I briefly published a newspaper column and distributed it to small local newspapers in North Carolina. When I started my company, I expanded the newsletter into a subscription “magazine” called “Practical Aquaculture & Lake Management”. After ten years of production I decided to stop the magazine because the lake management business was picking up and I didn’t have the time to continue selling ads, writing all the articles and doing the layout work on my very primitive computer. Coincidentally, that was about the time “Pond Boss” started being published. Lusk has succeeded with his magazine through hard work, long hours meeting deadlines and because of his personality. He has the expertise! But, his writing style utilizes humor, down home (almost redneck) perspectives and a genuine interest in the people he writes about. He understands their desire for attractive productive lakes and ponds. He has a field advisory staff, contributing writers and guest authors that all write with a familiar, informal and easy to understand style. The articles appeal to a broad audience. They are not too scientific, but explain science concepts important for successful lake management. Improving fishing is a universal theme but requires education about water quality, aquatic vegetation management, fish genetics and behavior. Equally important is helping people enjoy their ponds through improving aesthetics, correcting existing problems and very importantly publicizing new products and techniques. Bob will send anyone who asks a free sample copy of the magazine. I know we give out samples to customers and they love it. 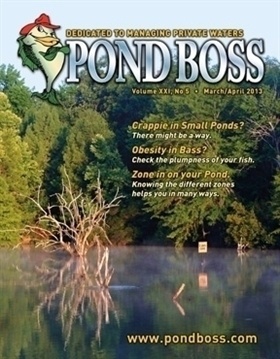 “Pond Boss” is published bi-monthly and a subscription is $35.00 per year. Request a sample: Pond Boss, Subscription Service Center, PO Box 12, Sadler, TX 76264 or call: 1-800-687-6075 or visit: www.PondBoss.com. Subscribe to receive notifications when we post new blogs.